Quiz Curve Scarf Printed Dip Back Wrap is rated 4.8 out of 5 by 4. 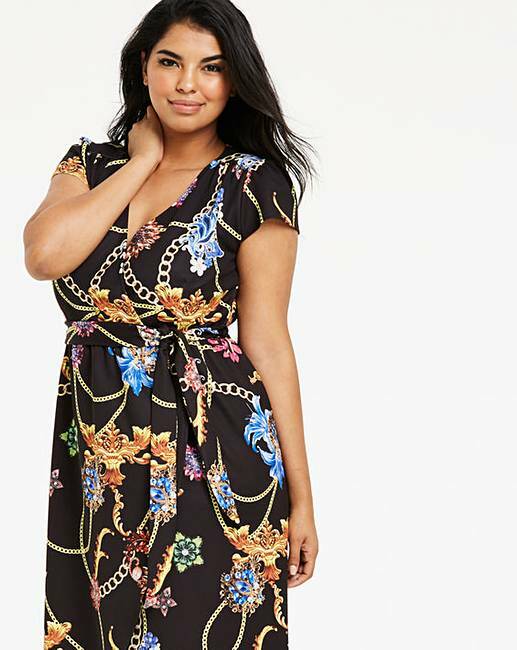 This scarf print midi wrap dress by Quiz Curve is the perfect piece for a day or night look. Complete with a tie waist, capped sleeves and V-neck, creating a flattering look. It can be easily dressed up or down with some casual ankle boots, or a pair of barely there heels and simple jewellery. Rated 5 out of 5 by Yorkshirejan from Lovely pattern and great quality. I ordered this dress in a size larger and it fits perfect. I’m wearing for a wedding with a colbalt jacket.. would def recommend. Rated 4 out of 5 by BigSis from Lovely fit Second of two dresses bought for sister. Again great value and fit. Rated 5 out of 5 by Ad1825 from Great party dress I bought this for my birthday and received lots of compliments. It’s very flattering and feels extremely comfortable.